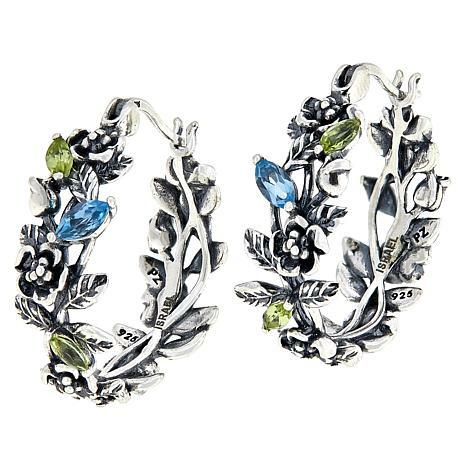 Like delicate bluebells pushing up through the snow, blue topaz and green peridot accents provide a touch of unexpected color to these delightful, floral-themed hoop earrings. 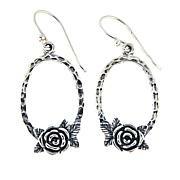 Think of them as an ode to spring you can wear all year long! I love hoops. However, Im usually more attracted to the slim, unadorned lines of a hoop. 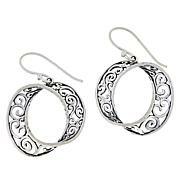 These hoops are so pretty & flirtatious. 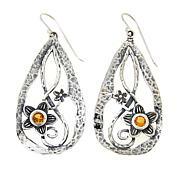 They look so pretty on & the blue topaz & peridot add such a sparkle to your face. Love them! 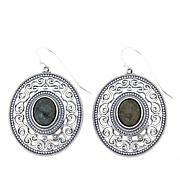 The details in these earring are gorgeous and well made but the colored stones have little color and are a bit cloudy. A little dissapointed. I liked these errings. The trouble with them is they dont stay on. Im going to try to squeeze the end. If it doesnt help Ill send them back. Wish they would test them out before they sell. May begin to buy only omega backs.